so cool this scan , love how ryoma looks so cute! 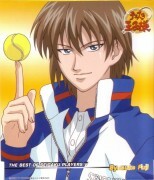 <3 *-* Love Seigaku! 3Q so much for sharing~! So rare to c kunimitsu smiles~! Haha~! 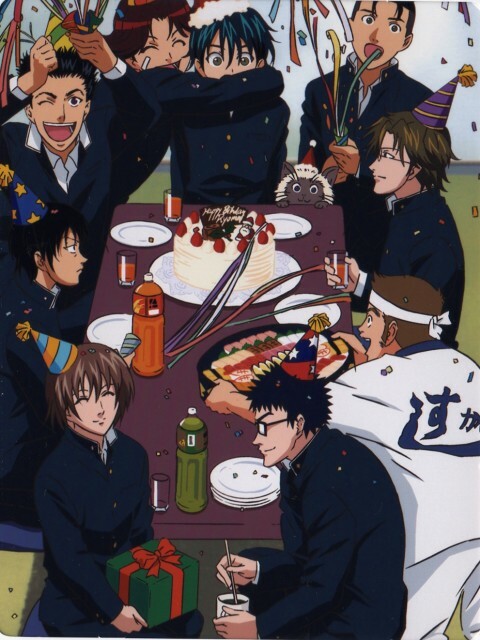 ahahaha look at how evil inui looks here! seems he's planning something with that juice again! lol it does look like the streamer is going into oishi's mouth! tis is really great. my goodness, tezuka is smiling. Hoi, Syusuke looks so sweet! I love you! TEZUKA SMILES! THAT MAKES ME SO HAPPY. THANK YOU. Yey. SO CUTE. And Tezuka is smiling. Everyone notices that. I would rather have two presents seperate..haha O I LOVE THIS SCAN! Ryoma looks surprised! A surprised party! Oishi's face! So adorable! Even Tezuka is having fun there XD Thanks for the scan, it's always nice to see the boys so happy and cheeful together.